After a lot of discussions with local people, here we are with our newly launched limited edition kit with Organic Cold Pressed PEACH KERNEL OIL AND MEAL (SCRUB) made by an NGO providing livelihood to women in Uttarakhand. Peach season in India is from April to June and the oil is only extracted in the months of August & September. We wanted to get you the freshest, traditionally made and organic Peach Kernel Oil which is why we launched this oil as a limited edition product. – Peach Kernel Oil contains vitamins A and E as well as a variety of B-group vitamins. Vitamin E is particularly beneficial to your skin as it is an antioxidant. – Regular use of Peach Kernel Oil maintains the elasticity of the skin because it contains varieties of polyunsaturated fatty acids, or PUFAs, which are associated with skin growth and health. – The soothing, emollient nature of peach kernel oil can also benefit anyone who suffers from the dry, flaky or sensitive skin. – Individuals with delicate skin can also use it as a cosmetics remover. Unlike some other oils, peach kernel doesn’t leave an unpleasant residue. – It is added to handmade creams, massage oils, lotions, lip balms and skin lotions as it possesses anti-aging properties as well as penetrative consistency. – It provides relief from itching and dry as well as inflamed skin. – Peach kernel oil’s use in hair care formulations is similar to skin care. It acts as an emollient and is a light oil (easy to wash out and it doesn’t weigh down thin hair). Our Peach Kernel Meal is finely ground from the kernels of the peach fruit. This finely ground powder is perfect for gentle exfoliation without making your skin dry. It has a lovely aroma because of it's Peach oil content. Just mix half tablespoon of our peach kernel meal with rose water or milk for a mild exfoliator that won't make your skin dry. 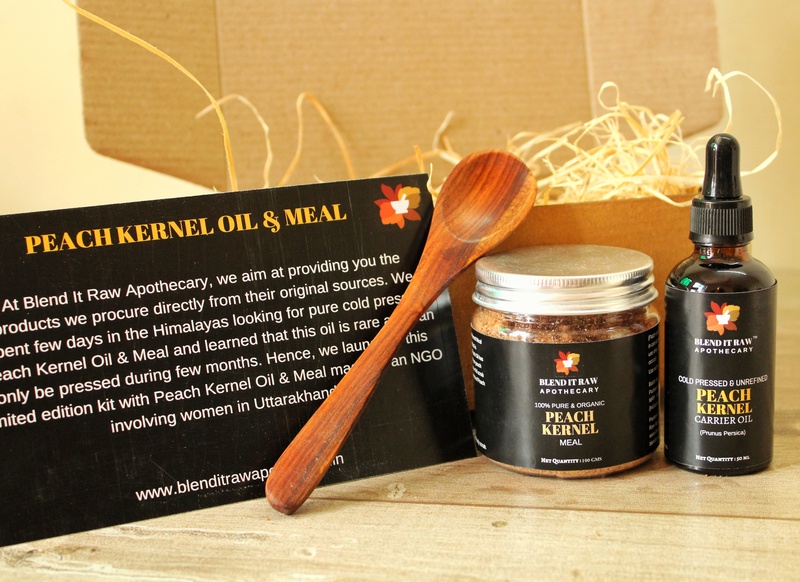 You can now get your hands on our limited edition kit with Organic Peach Kernel Oil and Meal (scrub) made by a small NGO in Uttarakhand on our website. Link to shop in our bio. Our Peach Kernel Meal is finely ground from the kernels of the peach fruit. This finely ground powder is perfect for gentle exfoliation without making your skin dry. It has a lovely aroma because of it’s Peach oil content. Just mix a half tablespoon of our peach kernel meal with rose water or milk for a mild exfoliator that won’t make your skin dry.